It's Karen on the blog today to post my Summer Daisy Friendship Card. I used a beautiful daisy stamp that comes in the Flower Bird Sketches Rubber Stamp Set. 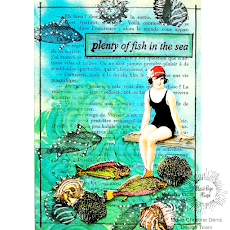 This is a perfect feminine card that can be used for a variety of occasions by simply changing the color scheme. I aimed to create a country kitchen & quilt style patchwork card suitable for a woman who is not a fan of bling like gems & glitter. I love that Sin City Stamps are not only for those who like a distressed & vintage style but also can be used for clean & cheery designs. 1. Stamp the daisy flowers using watermark ink onto red cardstock twice. 2. Apply white embossing powder and heat set. TIP: Before you melt the embossing powder, closely check the image for any tiny particles of embossing powder that have gone astray and use a paint brush to carefully sweep them away. 3. Color the embossed images using colored pencils. Use gold ink to color the center of the flowers. 4. Carefully cut out the flowers of one image and adhere them to the complete image using dimensional foam tape. Offset the petals to create a layered appearance. 5. Adhere the complete flower panel to a piece of scallop edge white cardstock. 6. Next, attach green cardstock to the card base leaving a narrow border and then adhere pattern paper on top leaving a 1/8" matte. 7. To give the appearance of stitching, use a white gel pen to draw a dashed border around the edge of the red cardstock. 8. Use black ink to stamp the word "friends" onto white cardstock. Add a black frame and trim away excess paper. Adhere it overlapping the lower portion of the red panel. 9. Finally, add more faux stitching by using a white gel pen to draw a dashed border around the edge of the green cardstock. For more inspiring paper-craft projects from the Design Team, be sure to visit us at the Sin City Blog and follow us on Facebook. Don't forget to join the Sin City Fan Group.